Beautifully upgraded Ocean View end unit C Plan at Sea Point with several extra windows for the additional views and light. Wood floors in Living Areas. Lovely new kitchen cabinets reorganized to include an island, elegant granite counters and custom lighting. All new windows - with shutters in many areas and privacy/filtering blinds in the Living Room to help with afternoon sun. Upstairs is the large master, also with great views, and the secondary bedrooms are off the entryway. Suppl., Downstairs is an extra room with window, not included in the square footage, used as an office library, but could have other uses. 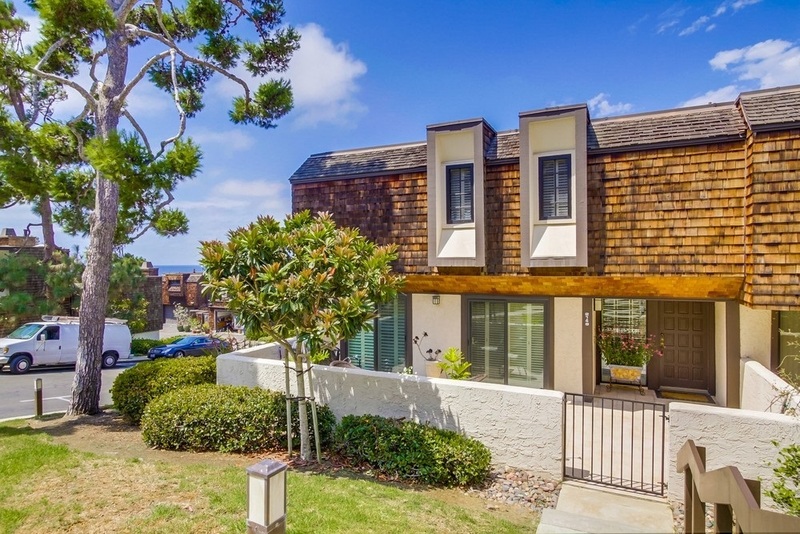 Sea Point is an excellent place to call home close to the beach and the Torrey Pines Parks with great walking trails. There are also all the good amenities in the complex, and close by are several restaurants/eateries. The village of Del Mar is around the corner, and there is easy access to the major freeways to get you downtown and to the airport.